Warm, melty brie is always a pleasing appetizer to offer guests. A simple adornment of thinly sliced red plums, glazed with preserves and garnished with toasted walnuts, is sure to please even more. Melt preserves and water in small pan over low heat. 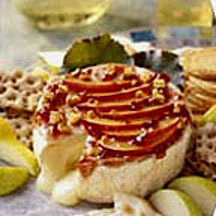 Brush melted preserves over top and sides of well-chilled Brie. Arrange plum slices decoratively on top of Brie. Brush fruit with additional melted preserves. Sprinkle with walnuts. Place Brie on foil-lined baking sheet with low sides. Bake for 10 to 15 minutes in center of oven until heated through. Remove from oven and let sit for 2 to 3 minutes. With large spatula, carefully transfer to serving platter. Serve with assorted lavosh crackers, torn pieces of Tuscan bread and pear slices. *Other size wheels of Brie may be substituted, just increase or decrease amount of topping as needed. **Any seasonal fruit may be substituted for the plums, such as nectarines, apricots or pears.